BullGuard Internet Security is an award-winning, user-friendly Internet Security suite which is designed to help users surfing Internet with confidence, protecting your personal computer and everything on it from viruses, hackers, spam, spyware and other online threats, along with secure online storage for backing up your valued data. Currently, the latest version of BullGuard Internet Security is BullGuard Internet Security 9.0. BullGuard Internet Security 9.0 normally costs $60 for 3-PC on one year license. 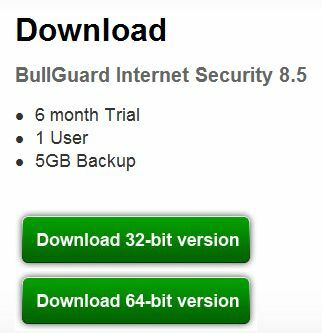 As part of BullGuard promotion, interested users can download the BullGuard Internet Security 8.7 with 6 month subscription for one user for free. Best of all, BullGuard Internet Security 8.7 can be upgraded to BullGuard Internet Security 9.0 for free. The software also provides free 5 GB online backup space. Visit promotion page at http://media.bullguard.com/landingpage/maplin. Note: This is version 8.7 although it stated as BullGuard Internet Security 8.5. After installation complete, you will be asked to fill in your email address for registration of BullGuard Internet Security, and the password will be generated for you. An email containing a link that directs user to log in page of BullGuard account will be sent. Use the generated password to access your personal BullGuard account. Key in your registered email address and password that used to log in your BullGuard account for registration. BullGuard Internet Security 9.0 is fully compatible with Windows Vista, XP, 2000 and Windows 7 OS.